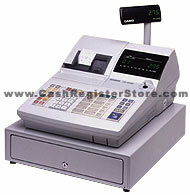 Casio CE-6000 Electronic Cash Registers at Cash Register Store. The Casio CE-6000 is the entry level cash register to the higher-end Casio line. An alpha-numeric journal and receipt printer and a full size metal 5 bill, 5 coin cash drawer is standard. The Casio CE-6000 is a raised keyboard cash register with 15 departments, 1 serial port (PC connectivity) and the ability to remote (detach) the cash drawer. The Casio CE-6000 feature set offers 2 price levels per PLU, scheduler function, tracking totalizers/departments/PLU's by hourly interval, arrangement operations with mode lock changes, food stamps plus many more features. Another outstanding feature is the Casio CE-6000 cash register can be programmed and used in Spanish, French and German.